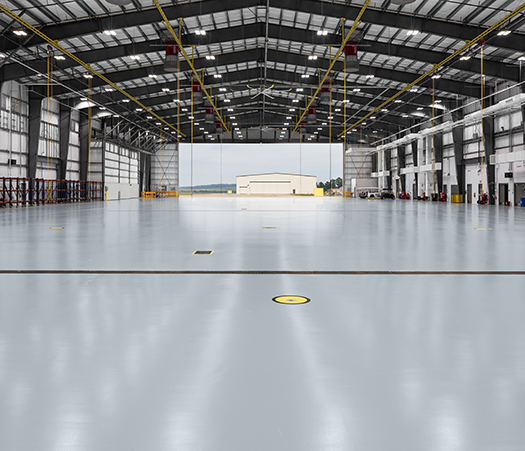 The newly constructed hangar, required a resinous floor coating system that would leave a lasting impression while holding up to high traffic. Most importantly, they needed a system that would help dissipate the build-up of static electricity, helping keep their avionics, equipment, and personnel safe from static discharge. Tennant’s Eco-SDS™ Satin System (Static Dissipative System) was the answer to their static control needs. The final result, Eco-SDS™ Satin delivered a dissipative functional floor that is easy to maintain, with a striking appearance. Additionally, the installation of a moisture vapor barrier system was a must with their newly poured concrete slab. New concrete usually contains high moisture levels for several months as it continues to cure. 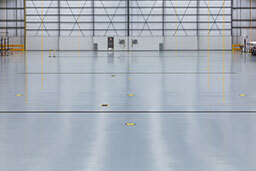 The Yulista hangar slab tested high in moisture, at more than 90% relative humidity. 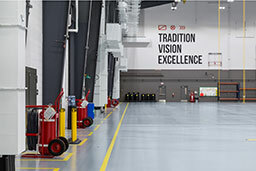 As a result, in order to protect the Eco-SDS™ Satin system from the damaging effects of moisture, Tennant’s Eco-MVS™ (Moisture Vapor System) was the perfect solution. The two layer system, helps create a barrier where moisture is unable to penetrate through, allowing the Eco-SDS™ system to function properly, while keeping its appearance free from moisture bubbles. Before applying the Static Control system, a moisture vapor system is applied. This system consists of two coats of Eco-MVS™. First a thin prime coat is applied, followed by a thicker grout coat of Eco-MVS™, helping create a barrier where moisture is unable to surface and penetrate the epoxy. 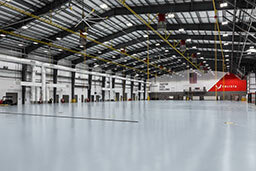 After the Moisture vapor system has been applied and cured, Tennant’s multipurpose epoxy, Eco-MPE™ is applied at 15 mils. 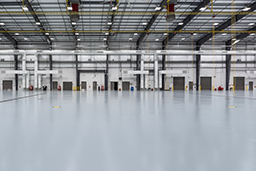 Finally a topcoat of Eco-SDS™ Satin is applied at 3 mils, creating an aesthetically pleasing floor that stands up to high traffic, while helping keep product and personnel safe from unwanted build-up of static electricity. Coatings solutions for the aviation / aerospace industry.